In June of 1935, a man by the name of James J. Braddock took boxing's world heavyweight title. Maybe you've heard of him; you might even have seen the notably average film about him. He was America's 'Cinderella Man'. Life sucked for everyone in 1935, and Braddock's life had sucked more than most, but having amassed the less than impressive record of 44-25, Braddock suddenly started to win with some consistency and was on the cusp of a title shot. Braddock had ludicrously fragile hands, where the champion, Max Baer was one of the greatest hitters of all time. But Braddock had the edge in skill, being trained by the great Joe Jeanette—a guy who fought Jack Johnson ten times, that's a PhD in boxing however you look at it. Braddock peppered a playful and overconfident Baer with one-twos, and took the title from him. 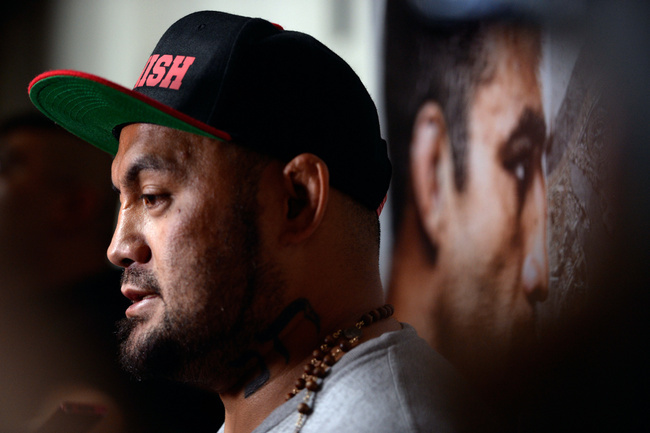 That is the man that Mark Hunt is being likened to in the media. There's some truth to it, Hunt's record entering into his current UFC tenure was a few losses the wrong side of mediocre. After his terrible run in the last days of PRIDE, he had some catching up to do. It was only in his 2011 win over Ben Rothwell that Hunt managed to break even on his career record. But Hunt had something which Braddock lacked, highlight reel potential in every punch. Braddock was attractive as a story. On the radio or in the newspaper, he was a terrific narrative, but he wasn't the world's most exciting fighter to watch. Jim Braddock was the people's champion, but he wasn't an active one. After disputes over a bout with Max Schmeling (whom the Nazis had appropriated as an unwilling poster boy), Braddock finally defended his title for the first time two years after winning it. This time he was just a challenge in another fighter's tale, however, as he met the young Joe Louis and, in losing to Louis, gave the country its second black heavyweight champion, who went on to be the greatest heavyweight of all time. Why was Louis so great? Because against a list of challengers that included the world and his mother, Louis laid most of them out. Never, ever underestimate the primacy of punch. But Hunt isn't all punch and no skill. There's a reason that he's here, and Melvin Manhoef can find no luck in Glory or in Bellator. By getting hunt up on the big punch, we ignore what Hunt has changed. He could always hit but the grappling has improved, his strength has increased, and he's faster, sharper and better at recognizing and manufacturing openings than he's ever been. The standard of striking across the board is much lower in MMA—especially heavyweight MMA—but I would happily put money on the Super Samoan of 2014 over Mark Hunt on the night of the 2001 K-1 Grand Prix. The counter left hook, the counter right uppercut, the effective jab to the fence and left hook on the circle out, the cross counter. This stuff wasn't there when Mark Hunt was throwing down with guys like Peter Graham and Ray Sefo. And I suspect this is all to do with that rock bottom that Hunt hit. After picking up his contract in the buyout of PRIDE, the UFC was willing to pay him not to fight for them. They were embarrassed by him. The UFC was touting the new breed of heavyweight (remember that? ), with Shane Carwin and Brock Lesnar. Chiselled giants. They didn't want a pudgy kickboxer with a 5-6 record and, five losses on the trot and back to back performances where he was finished by light heavyweights. It takes a moment to take that in. I know it all happened, but recalling Hunt's last few performances I struggle to think of him as the same fighter. And that's good, because he really isn't. He's gotten old. He's gotten tired of getting hit in the head. He's sharpened up his act and he's suddenly looking like one of the better defensive strikers in heavyweight MMA as well. I'll say it again, I rate Mark Hunt's dismantling of Roy Nelson as one of the finest strategic performances I have seen in the octagon. He took away Nelson's right hand, he jabbed Nelson to the fence, waited for Nelson to drop his head, and smacked it with an uppercut. Ultimately, the comparison to James Braddock is flawed. Braddock couldn't finish a fight for love nor money, and his game was point scoring and out-working the opponent. Mark Hunt's opponents are in there to survive. He's two parts Jim Braddock and two parts Jim Jeffries. If I really had to find a fighter to liken Hunto to, there's two which leap off the pages of history. Jersey Joe Walcott and George Foreman. Living below the poverty line, Walcott never found the title until he was trailing on the score cards in a fight with Ezzard Charles. Charles had already beaten Walcott twice, and was on his way to a third. But Walcott had power, composure, and the ability to find an opportunity. George Foreman, meanwhile, reclaimed the world heavyweight title twenty years after he lost it, by smartening up. Already the hardest puncher at his weight, Foreman started paying attention to the quality coaches who had surrounded him his whole life, and it showed through as an old timer. After nine rounds of eating leather, Foreman found his mark and became the oldest heavyweight champion in boxing history. Walcott was thirty-nine and Foreman was forty-five. Hunt's no spring chicken, but he's looked better in the last two years than he ever had before. Who knows the ceiling on his improvement. Perhaps he can be the active heavyweight champion with the highlight reel finishes that this sport needs.